Many of the brands that are popular today first appeared on the shelves in the 1950s. It was an era of renewal, as the old order made way for a brighter and more stylish future, and as manufacturers experimented with mass advertising for their lines. As the market leader Woolworth was able to secure generous terms from the suppliers by agreeing to push their new brands, working with them to develop fancy window displays and features in the stores, along with PR stunts to push the message home. As the decade continued not only did the Company resume its programme of mass openings (adding a branch a week between 1953 and 1958), but it also extended many of the existing stores, allowing it to allocate extra space to its confectionery range, and to experiment with new fixtures to modernise the presentation of its weigh-out sweets and to test the idea of shoppers serving themselves. World War II had forced major changes to Woolworth's ranging policies in the UK. By 1940 many everyday items were in short supply and most prices had doubled. The Ministry of Food had introduced rationing with the goal of spreading the available stocks fairly. When hostilities ended, far from being relaxed, rations were reduced to allow goods to exported as part of a scheme to pay down the huge costs of the war. Sweets remained in short supply until rationing finally ended in 1953. While rationing was a fact of live, behind the scenes the Buyer found unconventional ways to keep the confectionery range on sale. Traditionally a proportion of the weigh-out range had come factories in the Irish Republic. This was increased. The Emerald Isle was enjoying a period of prosperity and reaping the rewards from staying neutral during the World War. Irish Dairy Farmers were producing a surplus of full cream milk. By adding sugar they were able to make delicious fudge and a range of other candies. To add to the locally produced goods, a newly expanded Buying Office above the flagship store in Henry Street, Dublin, developed a way to circumvent post-war import restrictions. It purchased goods from Continental Europe, retaining some of the stock for the stores in the Republic and forwarding the balance north to Ulster or east to the British mainland. The scheme exploited the fact that Ireland had no controls over European imports, and had a long-estalishment free trade agreement with the UK. As a piece of clever marketing, despite shortages elsewhere, Woolworth Executives opted to hold the price of a quarter pound (around 125g) of boiled sweets down to sixpence, only raising the price on 'luxury lines' containing chocolate. By contrast bar lines had rocketed in price. Before the war slab chocolate had been a favourite promotion at sixpence (2½p) for a half-pound (227g) bar; now a similar line was half a crown ((12½p), an increase of 500%. The confectionery and snacks department retained its pride of place at the front of the store. Mirrors were added to the wall counters to brighten the wall displays and make them appear particularly well stocked. New lines like Pepsi Cola, which had been introduced on the suggestion of the New York office to please American airmen based in the UK, proved a hit with the public at large. Ice Cream, which remained unrationed, was in plentiful supply. Factories in Dublin sent over a dozen different varieties of cones and cornets, with toppings and sauces. Another key change in the 1950s was the introduction of an increasing number of bar lines (single, wrapped bars of chocolate and candy) as well as gift items like boxes of chocolates. 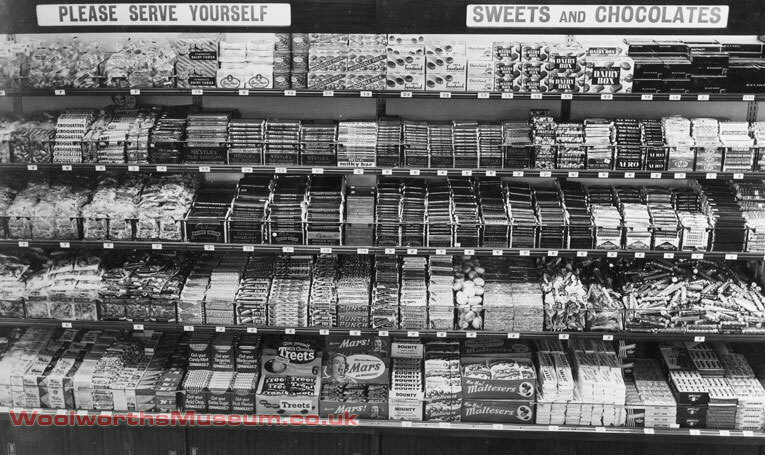 In the early 1950s it was quite normal to display pic'n'mix in one area of the store, drinks and ices in another and the shelved lines - chocolate bars, boxes and bags of sweets somewhere different again. Company bosses believed that most people bought these items on impulse rather than visiting specifically to buy them, meaning that they were dotted about between the main staple displays of toiletries, homewares and fancy goods. The picture shows the store in Crown Buildings, George Street, Pontypool in Monmouthshire (Gwent) in 1954. In the foreground an Assistant is serving a Customer with Pic'n'Mix, while the store's displays of Chocolates are in the centre of the store near the doors, more than fifty feet away. Like many of our images it was taken by Reg Gallanders, its Manager, who served with great dedication and commitment. He managed to capture the essence of a Fifties branch, with its salesfloor bustling with shoppers and staff busily giving personal service at each island counter. The period saw a shake-up to the layout of the displays. The emerging trend in retailing, which had started in the USA, was to abandon the style of personal service shown at Pontypool, getting shoppers to serve themselves before paying at a central cash desk, often adjacent to the exit doors. 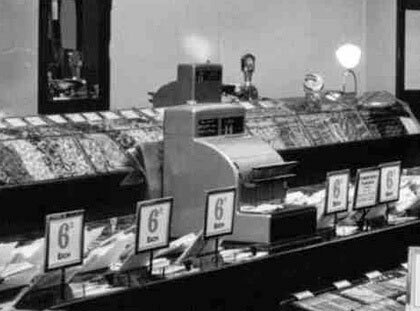 Today we are used to this supermarket-style shopping, but sixty years ago customers proved highly resistant to the concept during trials in Cobham, Surrey and Didcot, Oxfordshire. The self-service layout helps us to discern the individual products in the photos. Goods were shelved in several tiers, rather than being arranged between glass dividers on a single level counter-top. 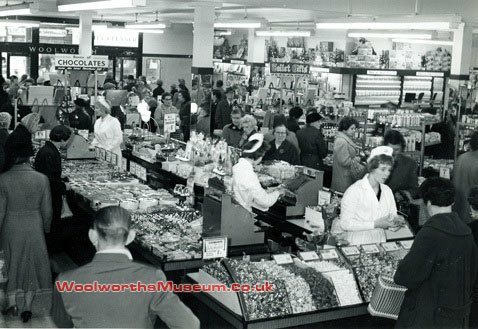 But at the time customers missed the friendly chats with the staff at each counter which had been a hallmark of shopping with Woolworth for almost fifty years. They also missed the helpful advice when deciding what to buy. 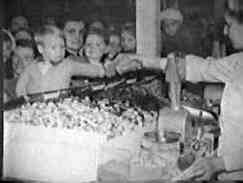 The next picture shows the confectionery selection at Didcot on its opening day in 1956. Many of the brands that the public trust in the twenty-first century can be seen. A close inspection reveals slab chocolate from Cadbury, Nestlé and Rowntrees, along with Mars Bars and Maltesers from Mars Confectionery. Treats have since been replaced with M&Ms. Although the early self-service stores got many things right, and in some ways were ahead of their time, there were plenty of mistakes. Company bosses had red faces when one branch opened with a sign stating 'This is a help yourself store'. It was clear at their annual stockcount that customers had taken them at their word and helped themselves to anything they fancied! Another blunder was the belief that it wouldn't be possible to sell pic'n'mix in a self-service environment, and the decision to stock only pre-bagged assortments. This was deeply unpopular and forced Executives to re-think, devising the style of layout which became a hallmark of the stores for the next fifty years. After a lot of soul-searching the fixtures team devised a self=service Pic'n'Mix counter. Just in case customers didn't like it, rather than testing it in a British store they sent it as far away as possible. The trial took place in the brand new store in Salisbury, Southern Rhodesia (today known as Harare, Zimbabwe), as shown below. It proved a big hit, and soon appeared at Guildford in Surrey before being extended nationally. The self-service fixture became a company standard for the next twenty-five years and still featured in a number of stores as late as 1987, as illustrated in the writer's own store at Camberley, Surrey. 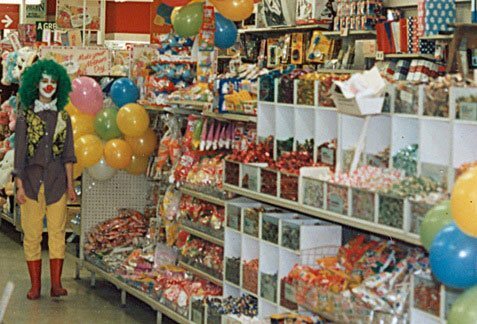 However bad the fixture may look, as ever the range of sweets was unrivalled, in a tradition that helped to sustain the High Street stores for almost 100 years.